Home » SPLAT » Am I a librarian? There have been many changes at my library recently, and they’ve gotten me thinking about what it means to be a librarian. I’m sure many of you have seen the memes about various professions. 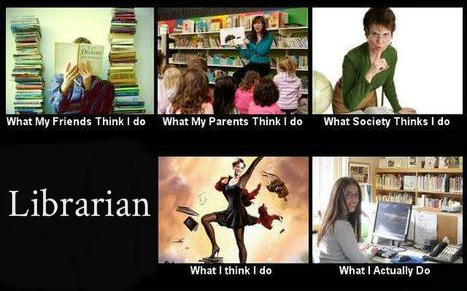 Here’s one about librarian’s. There are other versions of this, but this one rings true to me. I spend my days helping users with research questions, troubleshooting 3D designs, collaborating with faculty on curriculum design, writing, conducting research, leading workshops, and connecting with users in informal settings. I can go for days without even touching a book! Does this mean I’m not a librarian? No! There are many different types of librarians, and each of them plays their part in serving their library’s users. As technology and the needs of our users change, so will the skills librarians need to help fulfill those needs. When I graduated with my Master of Library Science, I had no idea I’d be helping students use 3D printers. I can’t wait to see what I’m doing in libraries another 10 years down the road! Space is a Premium: How will we use it effectively?